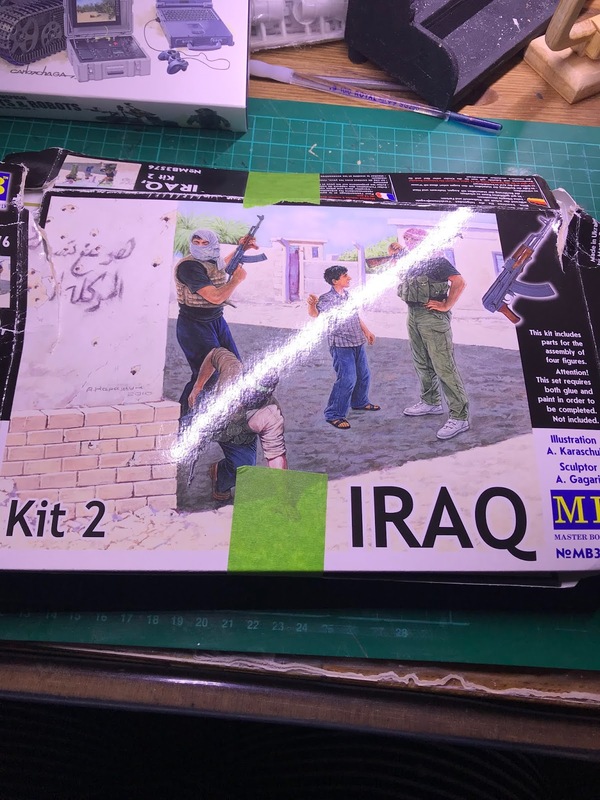 You are probably getting bored with my saying "I bought this because it was a bargain" but unfortunately this is 100% the case yet again! 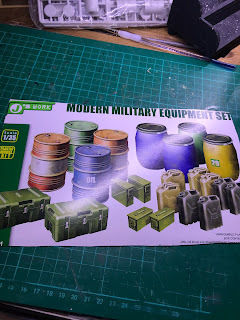 Around two years ago I was browsing Ebay when up popped the Meng models value set of two 1/35 scale pick-ups for the reasonable price of £25 delivered; that worked out at £12.50 per truck! 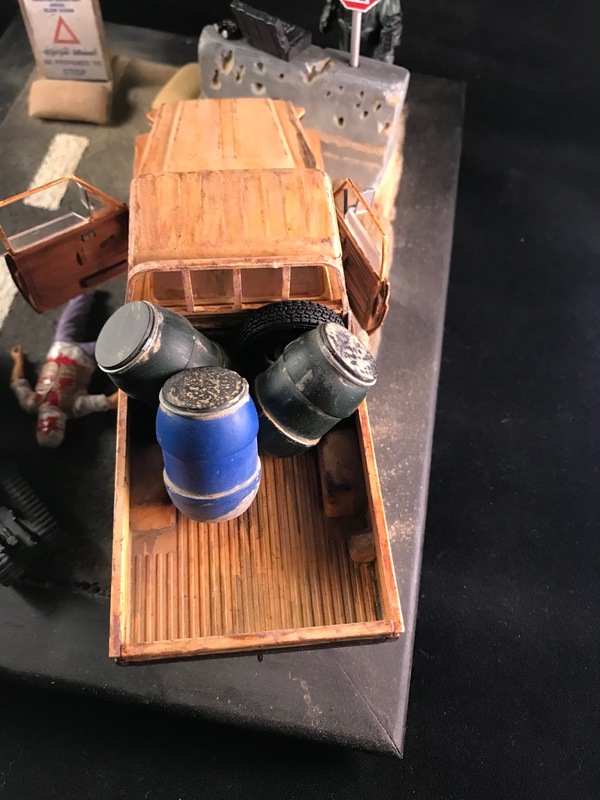 I immediately bought them and when they arrived placed them in the "stash" to await inspiration to hit. 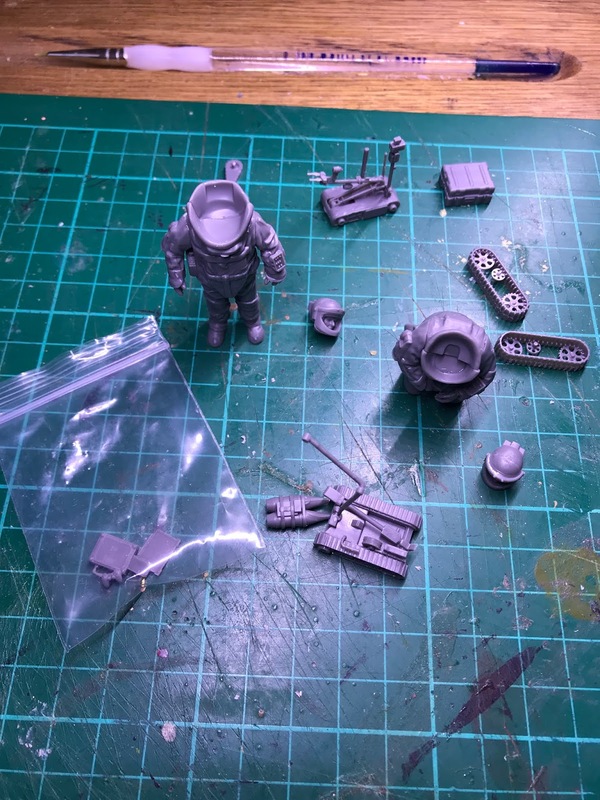 It was not until just before Christmas 2018 when yet again surfing the internet for bargains (amazon this time) that a Meng bomb disposal figure kit appeared for £10 and a diorama idea formed. 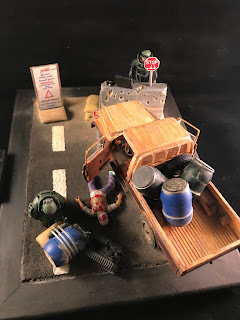 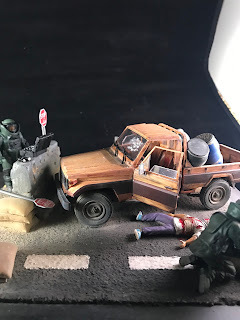 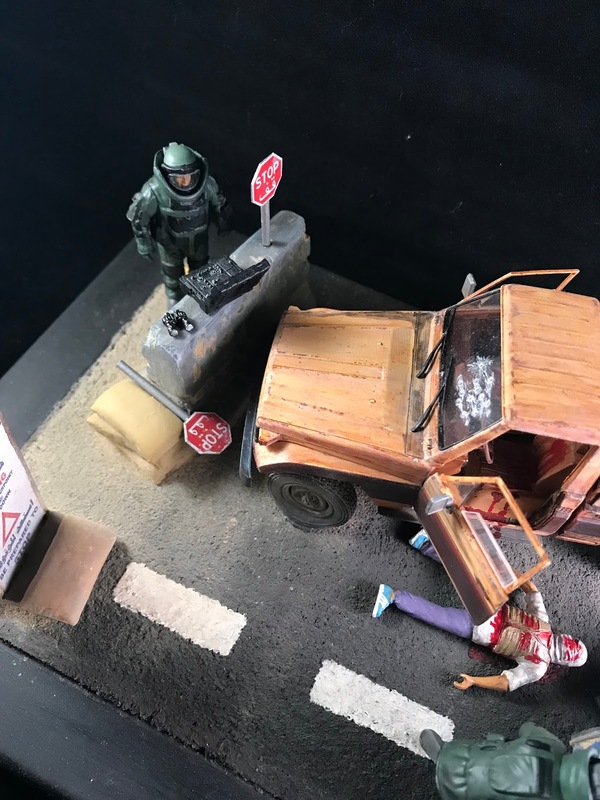 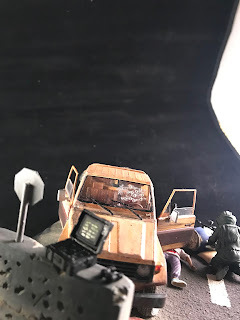 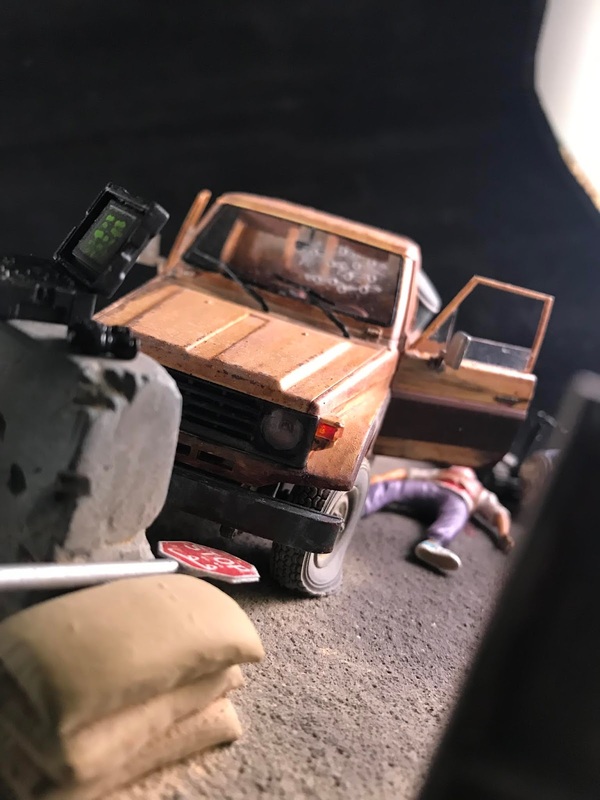 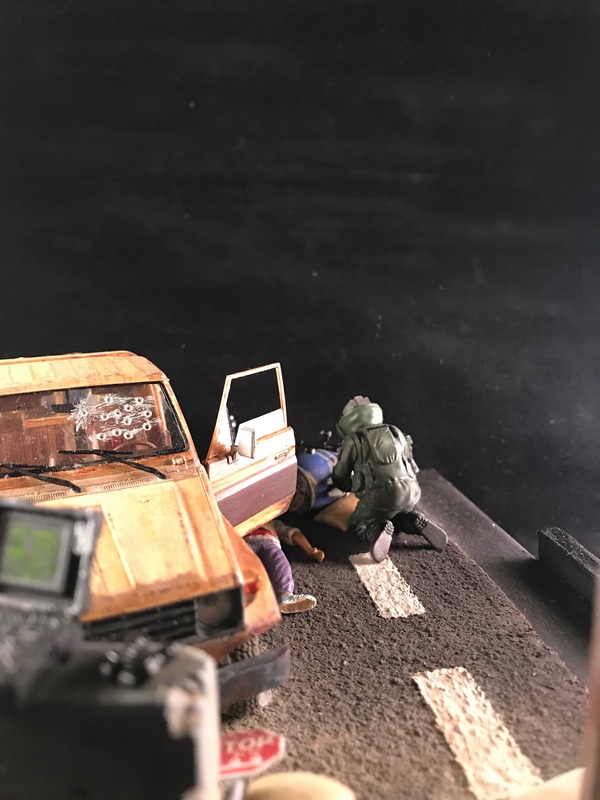 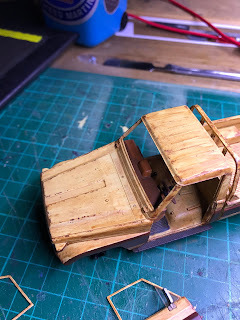 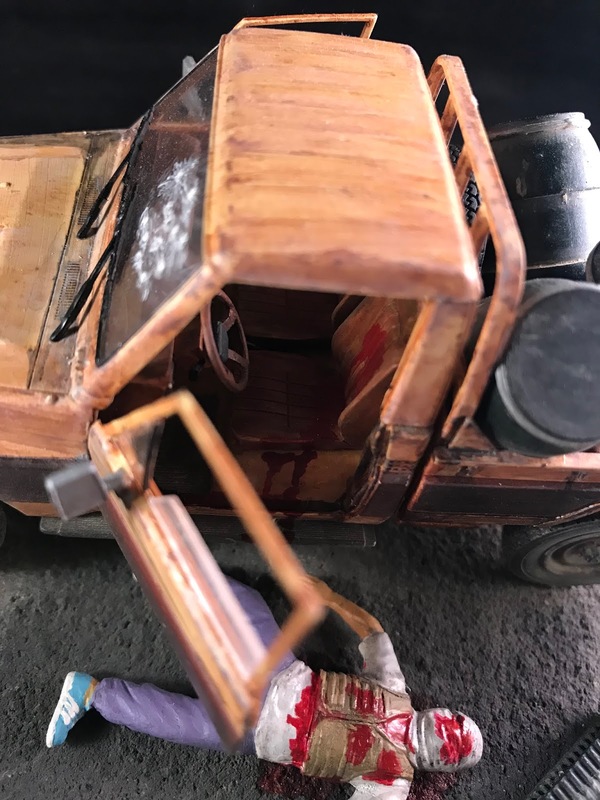 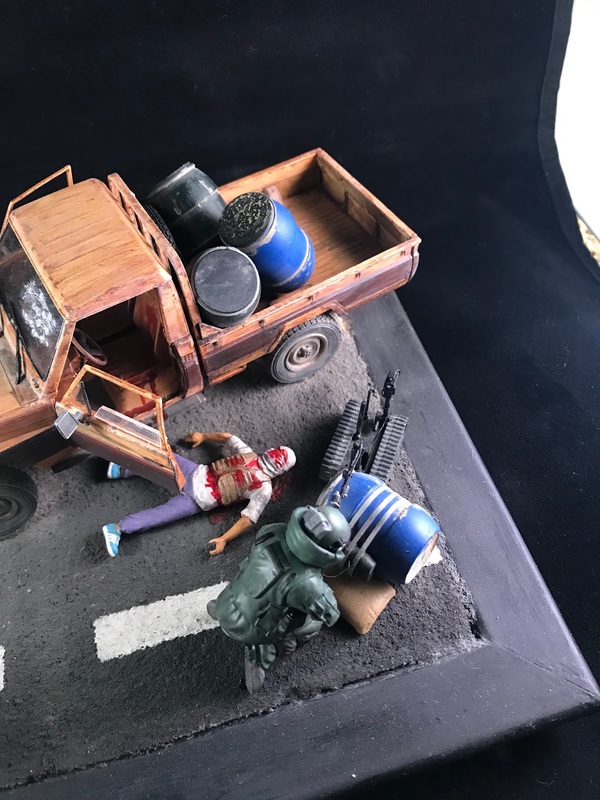 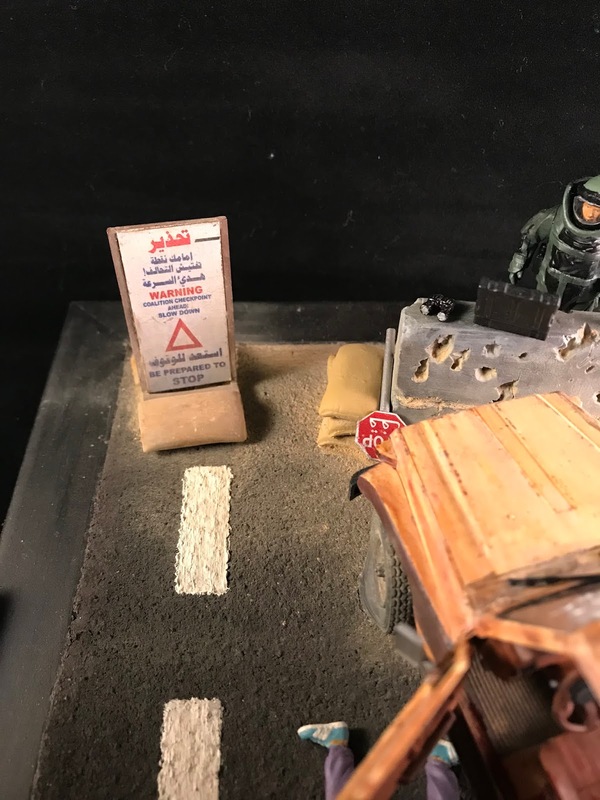 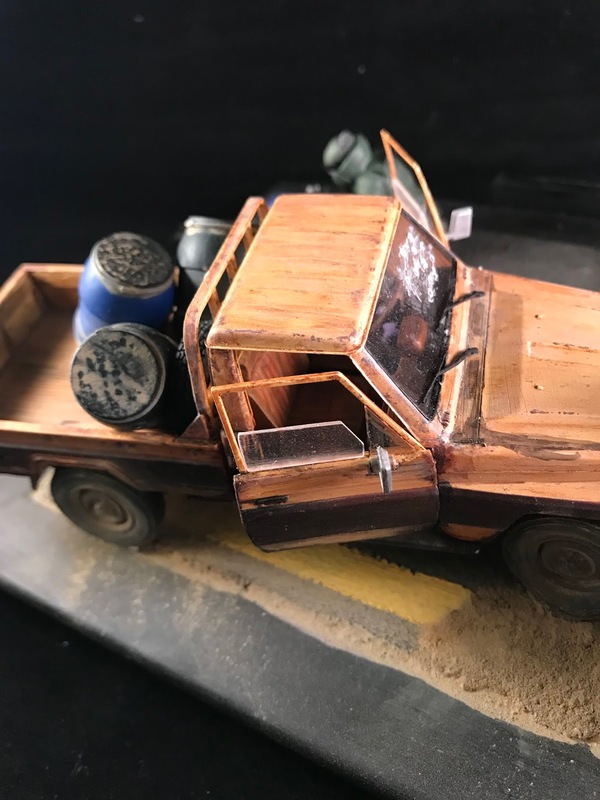 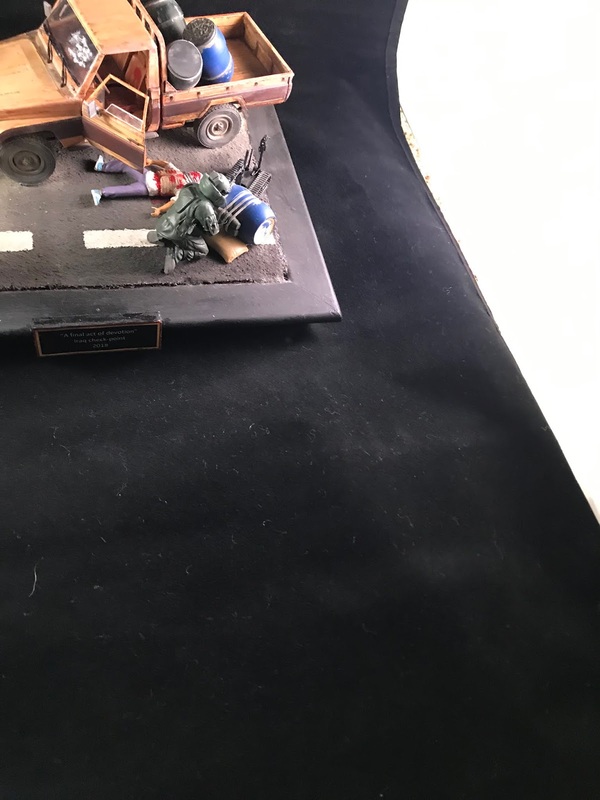 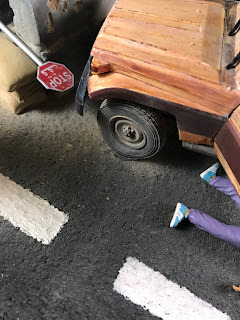 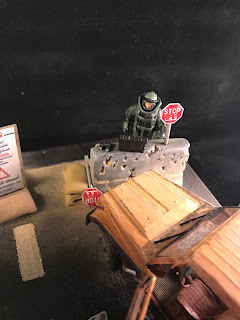 The diorama that I have in mind is to use the older of the two model pick-ups as a suicide bomb vehicle that has been stopped at a checkpoint in Iraq. 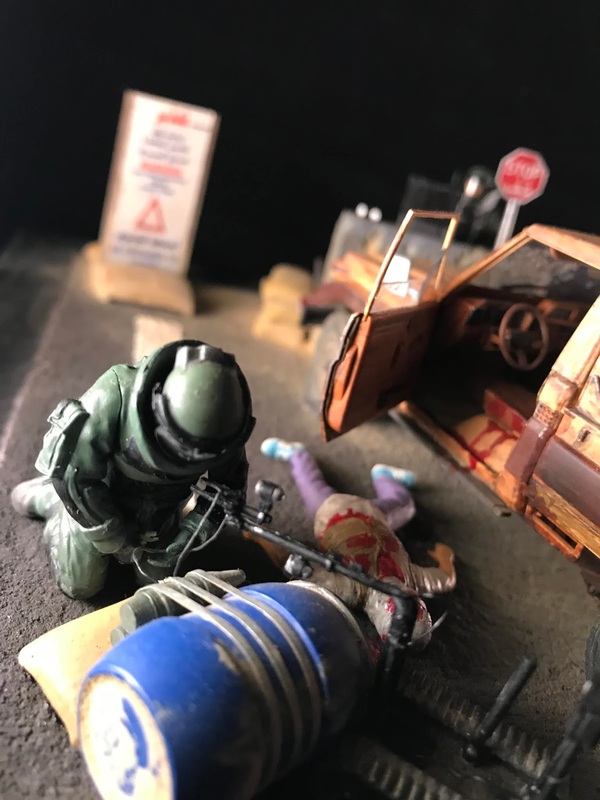 Fortunately the attack was thwarted but the bomb disposal unit has the job of defusing the bomb. 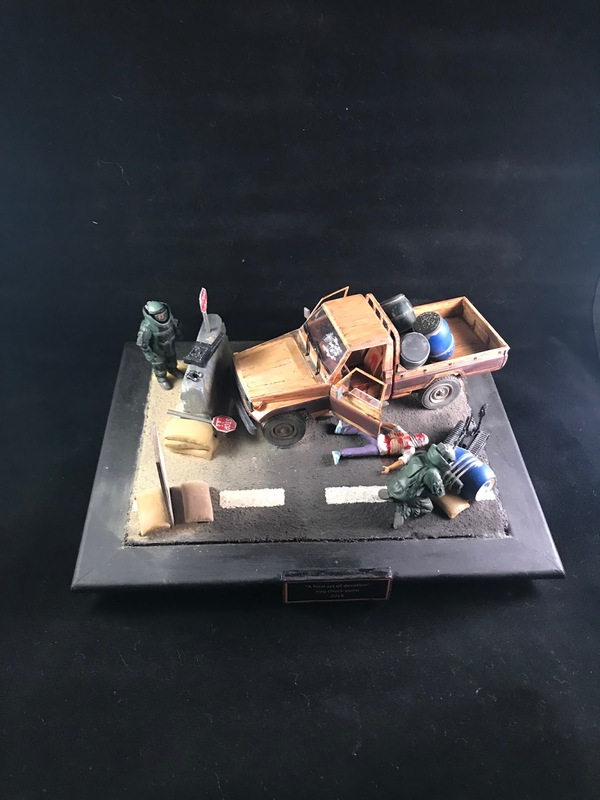 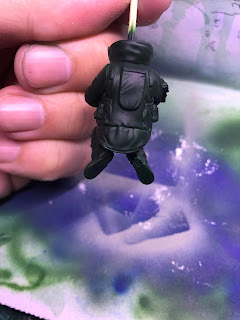 I always try to invoke thought, feelings and emotions with my dioramas and the intention of this one is to highlight the futility of the ongoing troubles in that area of the world at the moment. As seen above I will be using the pickup on the left of the box art for this dio; both figures and one robot from the bomb disposal kit; one figure from the masterbox kit (I have a stock of masterbox figure kits; and the large plastic barrels from the J's workshop accessory kit. 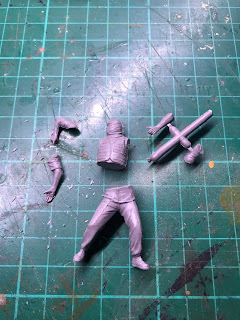 I won't provide much feedback on the masterbox figures as I am sure you have read countless times on my thoughts of the excellent quality of their figures. 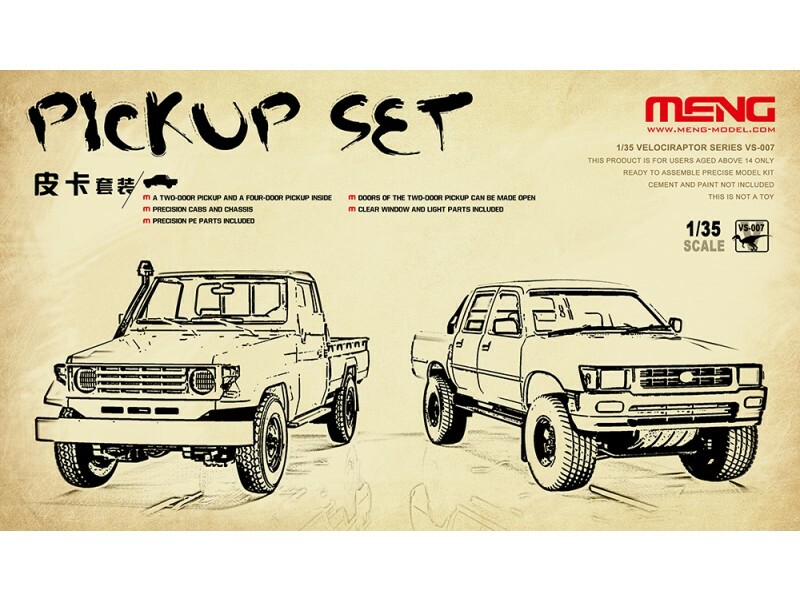 This is however the first time I will be building a Meng kit so I will try and concentrate my commentary to that. What struck me at first glance was the quality of the model. The panels and details were crisp and well formed. 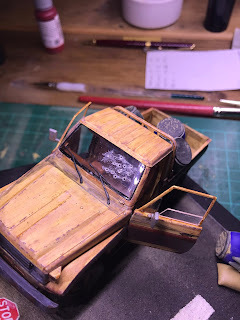 There was very little flash and as a result the build was extremely easy. I would argue that in this particular model it rivals the quality of tamiya military models. 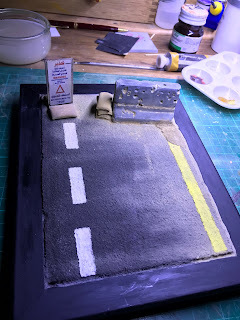 I decided to build this one out of the box as my plans involved additions rather than modifications for the diorama. Because of this I won't detail the basic build as I normally do as this is such a popular model that has been written about over and over. 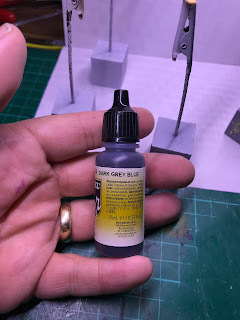 Instead I will will continue my trials of using Vallejo acrylics over enamels. 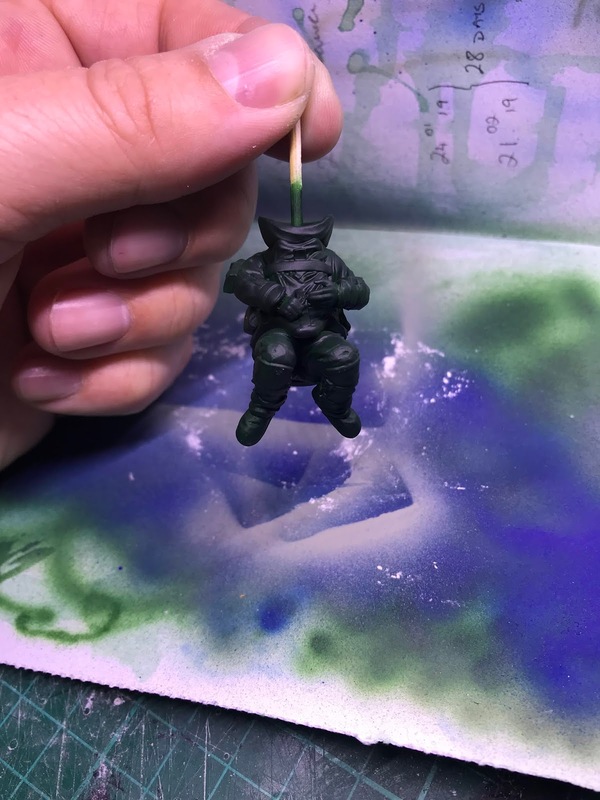 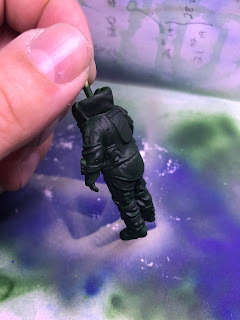 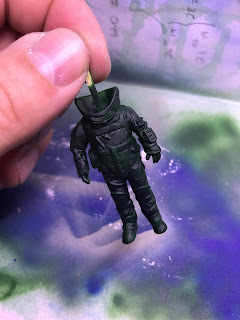 (this will be my second all acrylic model). 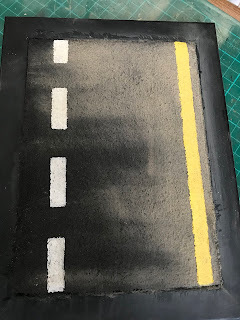 I experienced some teething troubles with the masking of the racing stripe. When removing the low tac masking tape I still managed to peel away some of the beige paint!! I honesty don't know if this was down to my abilities (probably was) or the masking tape not being as "low tac" as it was advertised. 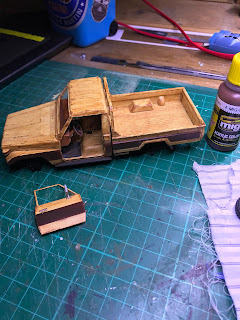 In either case it didn't take long to rectify the problem and move on to weathering and aging the truck. 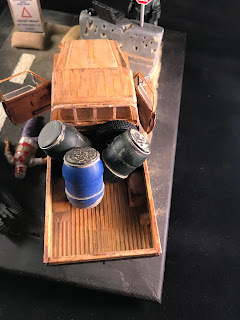 I wanted the truck to shown a hard earned desert life. 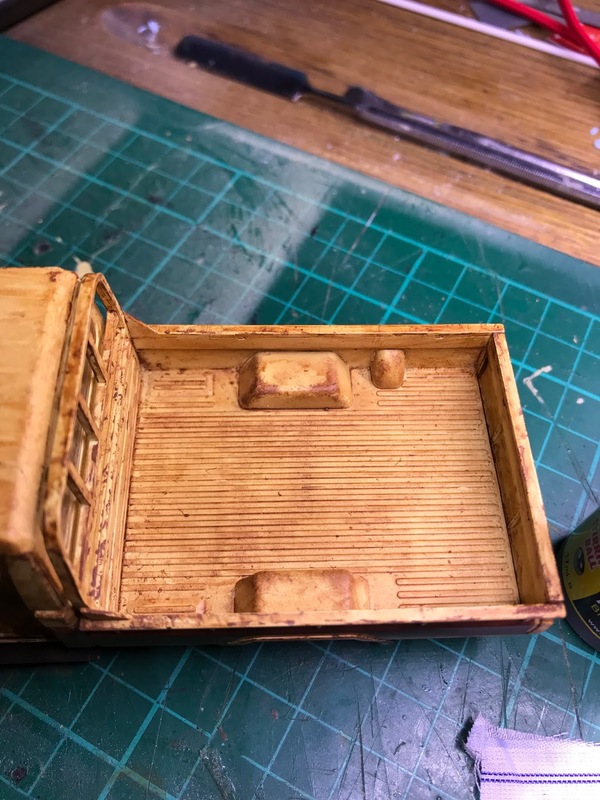 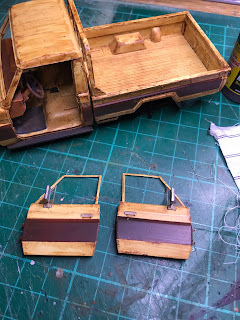 I achieved the look by dry brushing AK rust paint along the ridges of the bed and then using a very fine 000 brush I added paint chips and desert wear that had rusted over a long period of time. Because of the desert climate there isn't a need to imitate deep rooted corrosion as there simply isn't enough humidity. 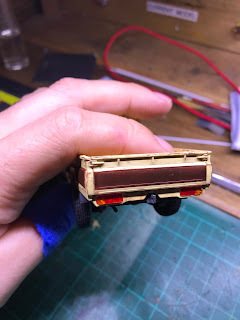 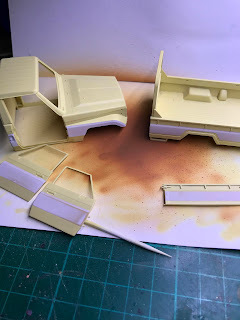 To finish I gave the whole truck a very light wash or stain in some burnt umber acrylic thinned with vallejo thinners. 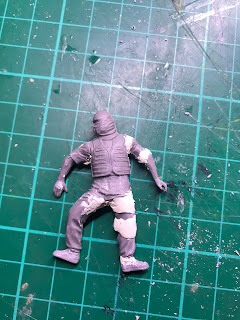 Some very fine light steel paint chips were placed strategically around the body to denote some fresh damage. 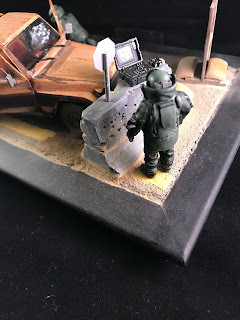 The two figures and robot were out of the box builds as their poses were perfect for what I wanted to portray in the dio. 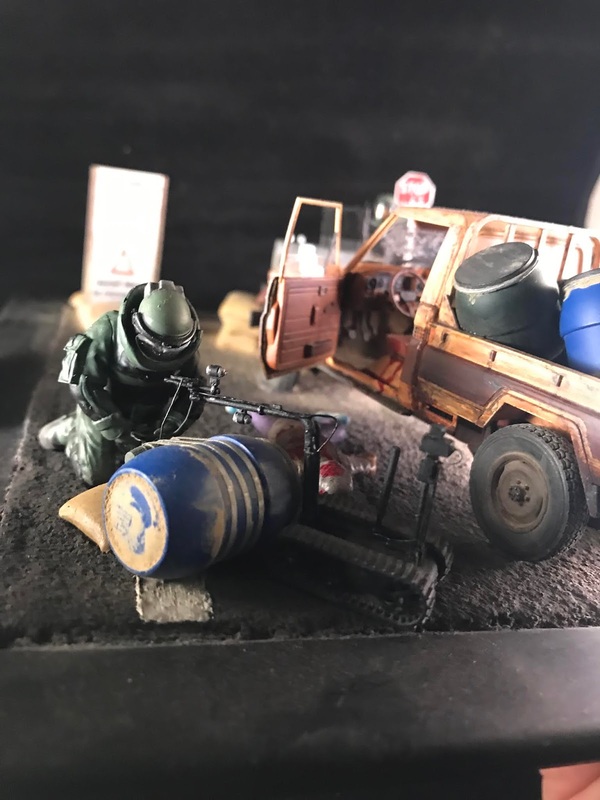 They are superbly detailed and very accurate when compared to reference photos from the internet. I closely matched the colour of the suits with the photos however this is not essential as the colour varies quite considerably between how old the suit is and where its used. The robot was painted in matt black with the tracks being painted in grey/black. 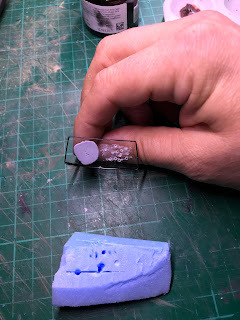 I opted to add some very fine fuse wire around parts of the robot to denote the electrical connections and I think that this added a little more realism to the piece. 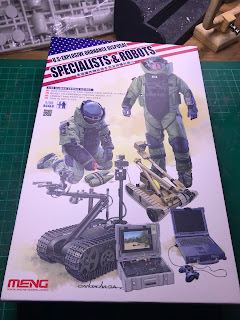 I'll make sure that I have some close up shots of the finished robt in the final photos as I completely forgot to take build photos of it! 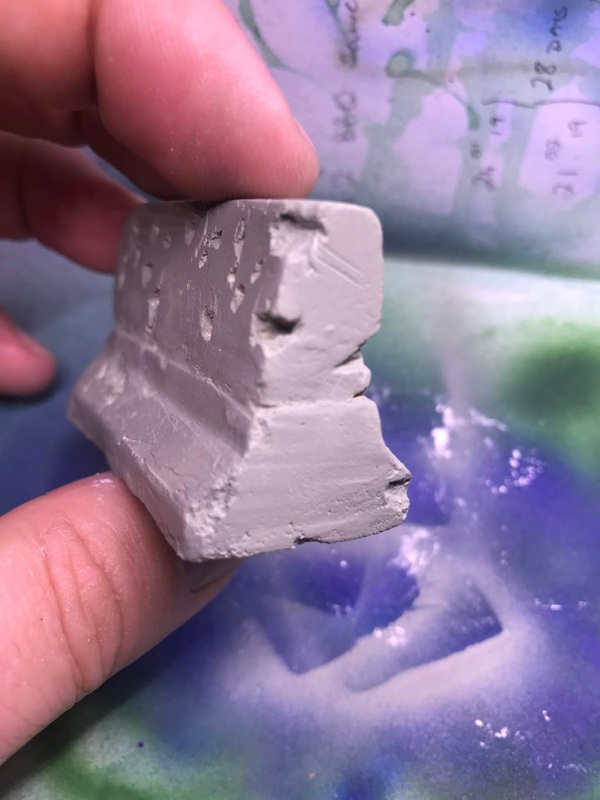 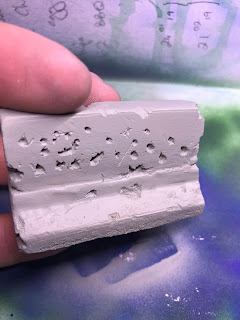 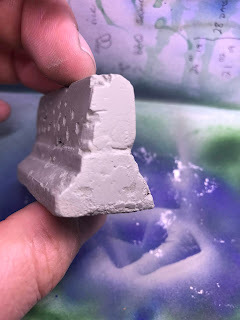 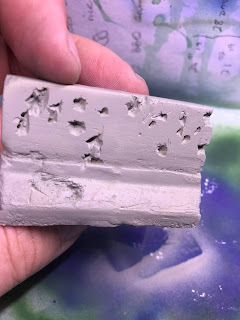 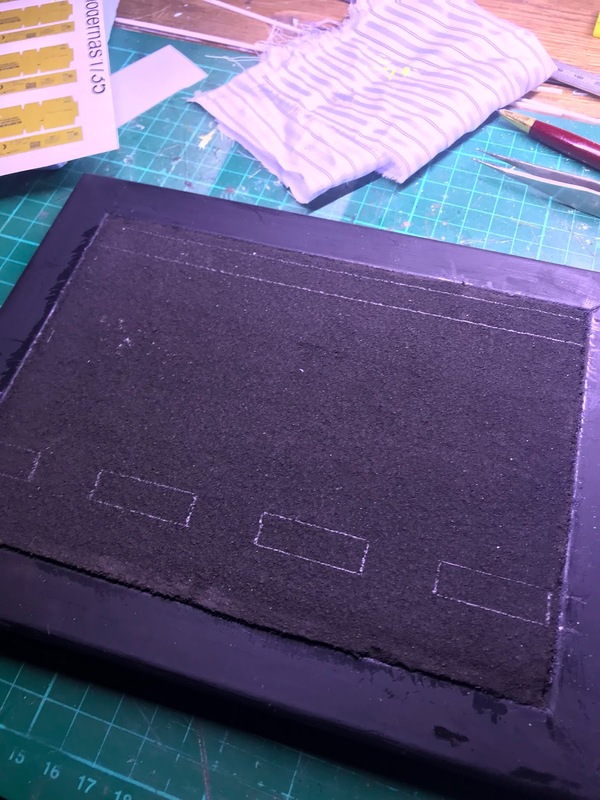 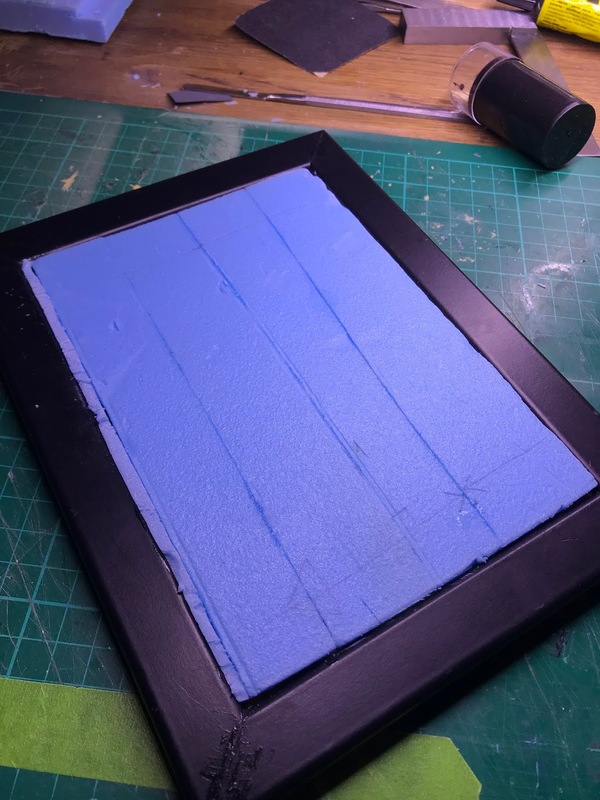 I could have dyed the plaster with acrylic paint before pouring it however I didn't know how this would affect the drying time or the plaster itself. 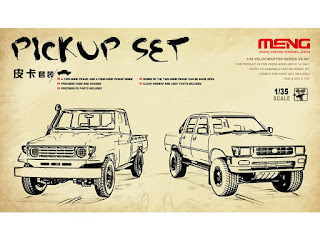 This is something which I may try in the future. 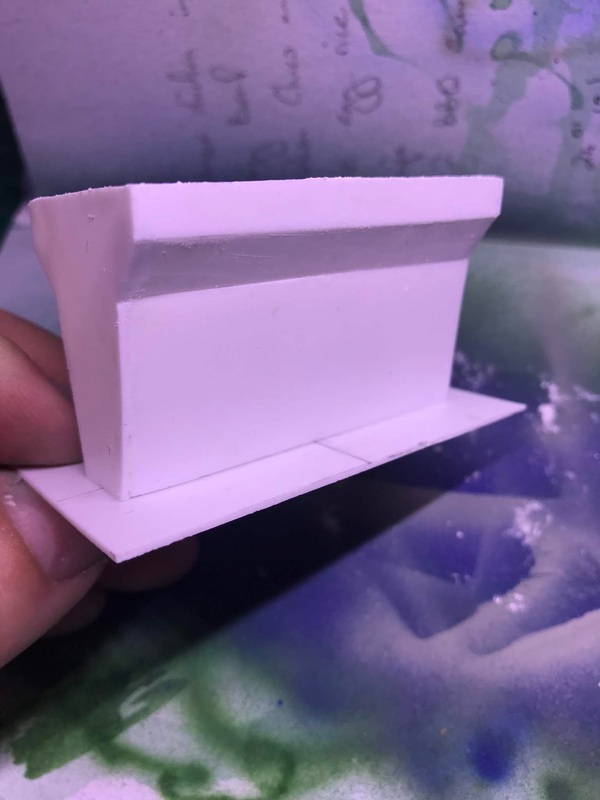 The rail came out of the mould really well cast and smooth. 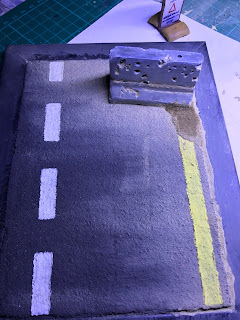 To achieve the beaten and shot up look I simply went at it with a pin vice and scalpel until I was happy with its appearance. 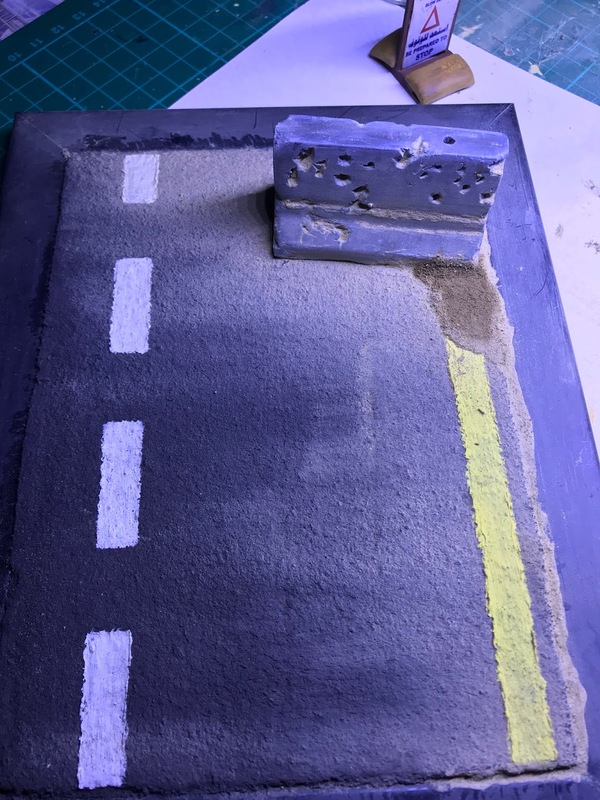 The rail was then painted in vallejo concrete as a base coat. 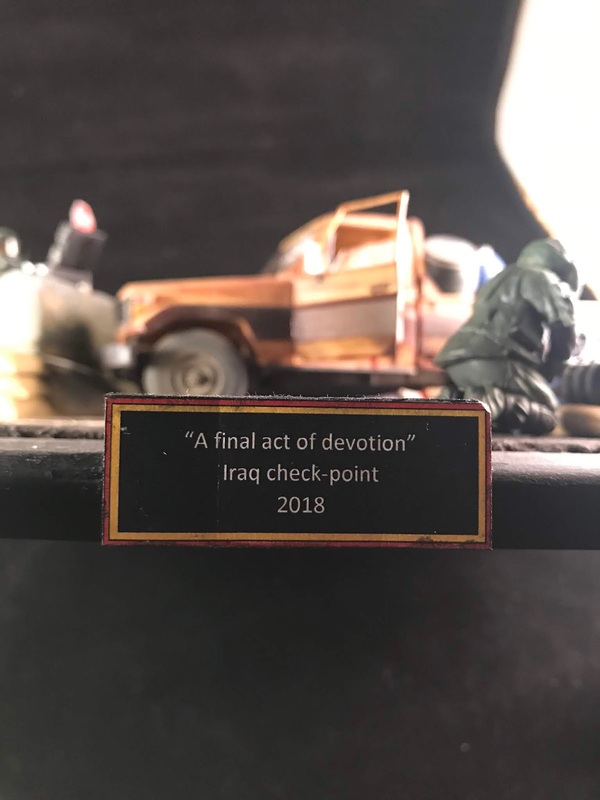 I also wanted to remove all doubt that the dio scene was that of a check point. 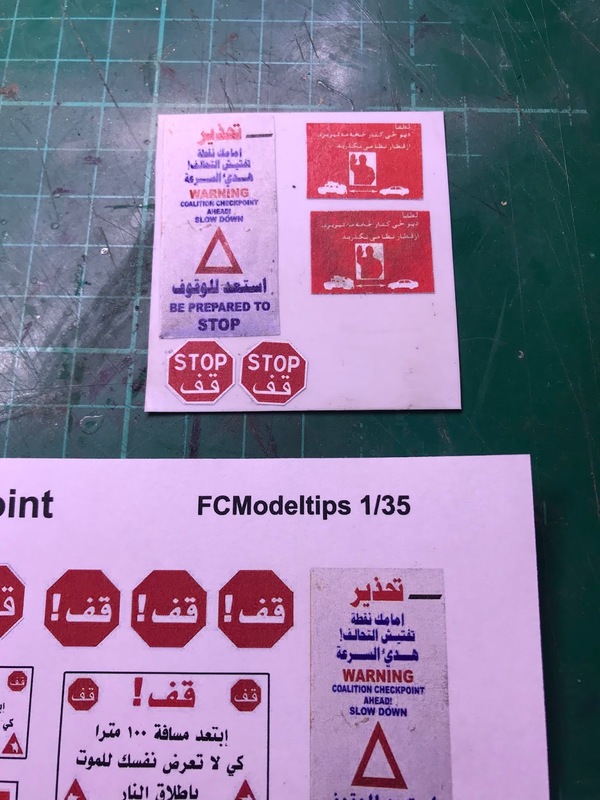 After a brief search I found some great reference shots of "locally manufactured" checkpoint signs and using a fantastic free web resource I was able to find the exact sign I wanted and print it. 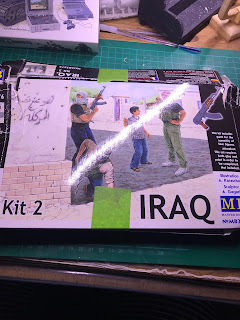 (i will include the link and information when I have the permission of the website owner). 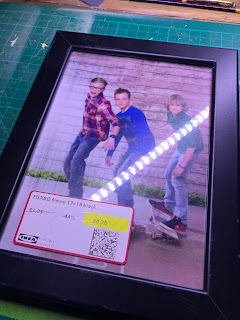 the sign was simply painted in some mod podge and pasted onto some plastic card. 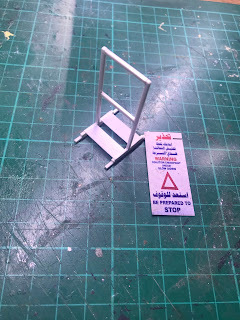 this was then glued onto some stock plastic rods that I built up into one of the makeshift signs that I had seen photographed. 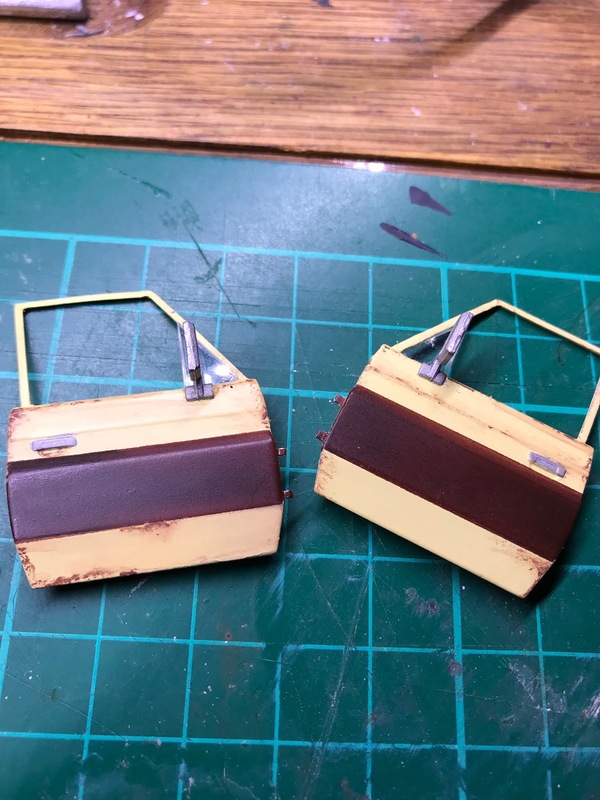 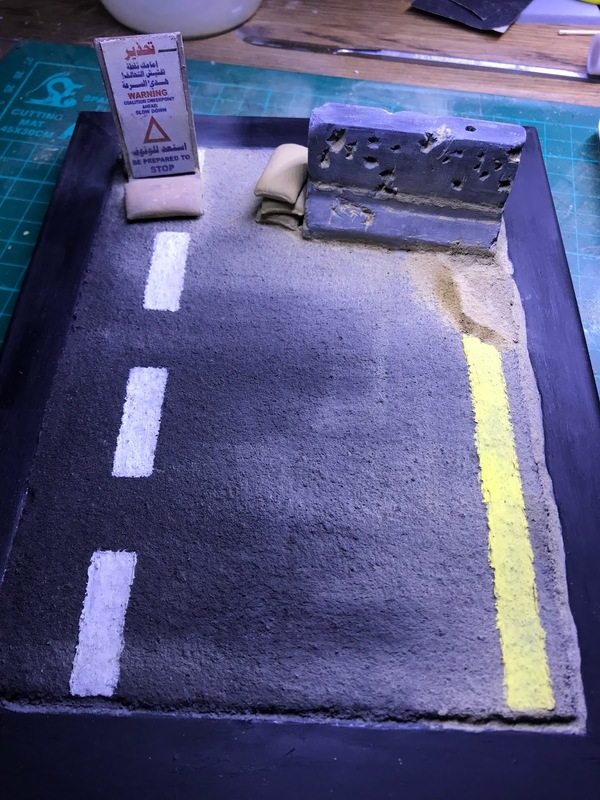 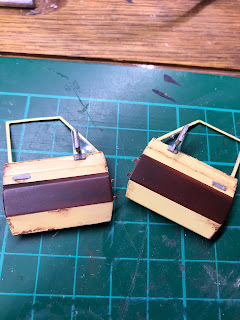 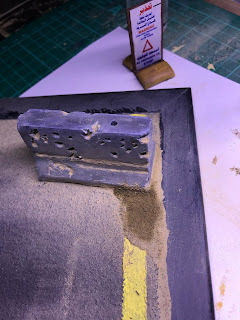 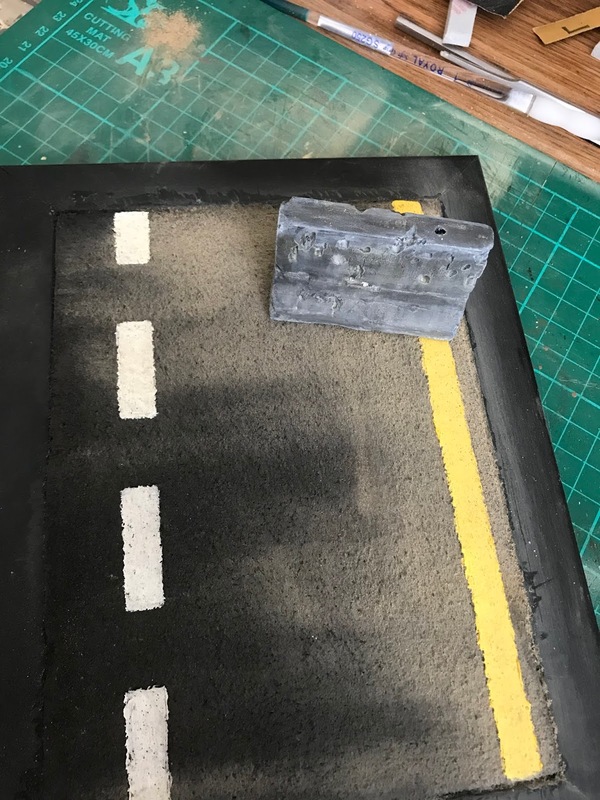 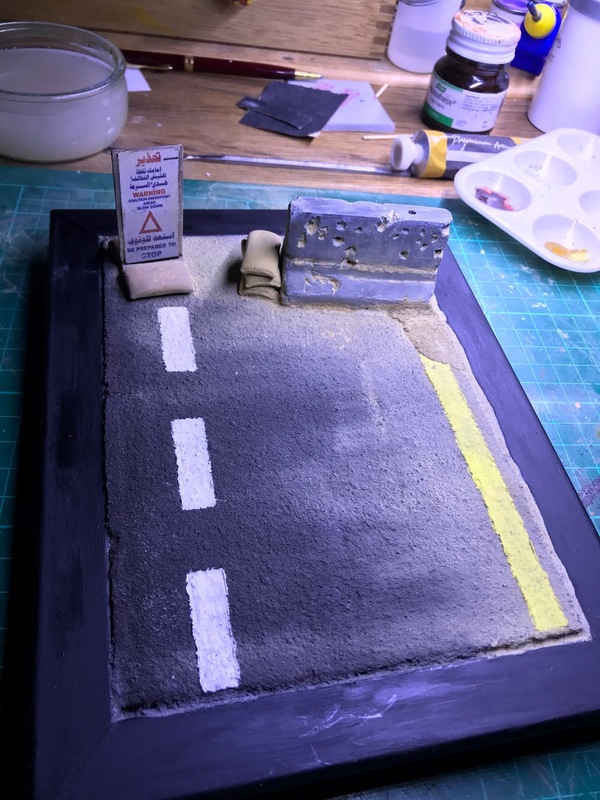 To tie everything together I used some Tamiya sandbags and lots of sand (my own dry mix). I am very aware that this could be a point of inflammation for some people so to avoid argumentative comments I will simply state that this figure has been made to help depict a typical event in a very troubled area of the globe. It is not intended to glorify or promote either perspective. This diorama is intended as a snapshot of history only. 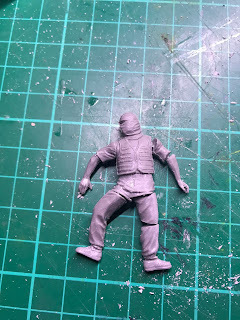 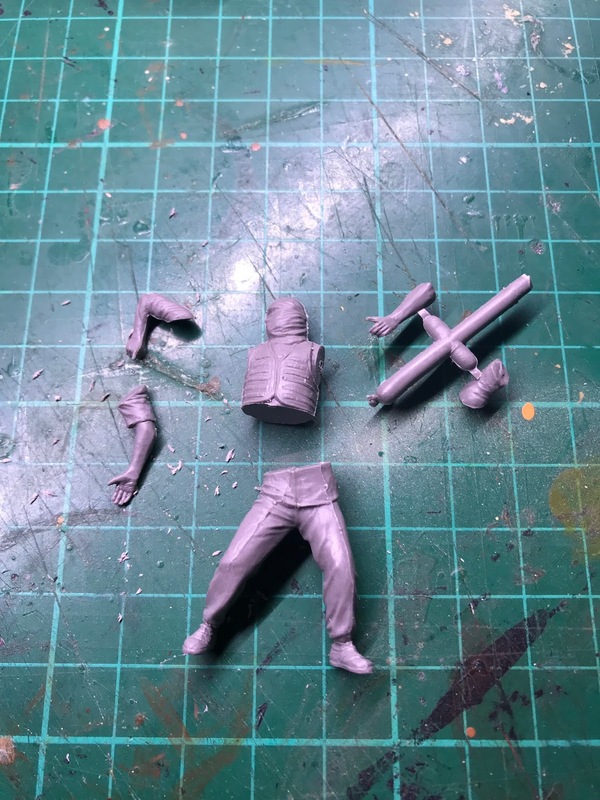 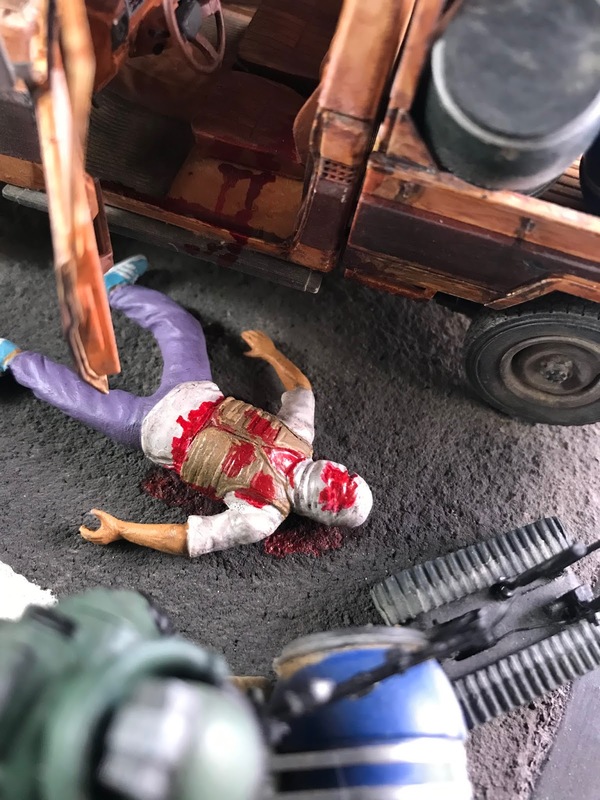 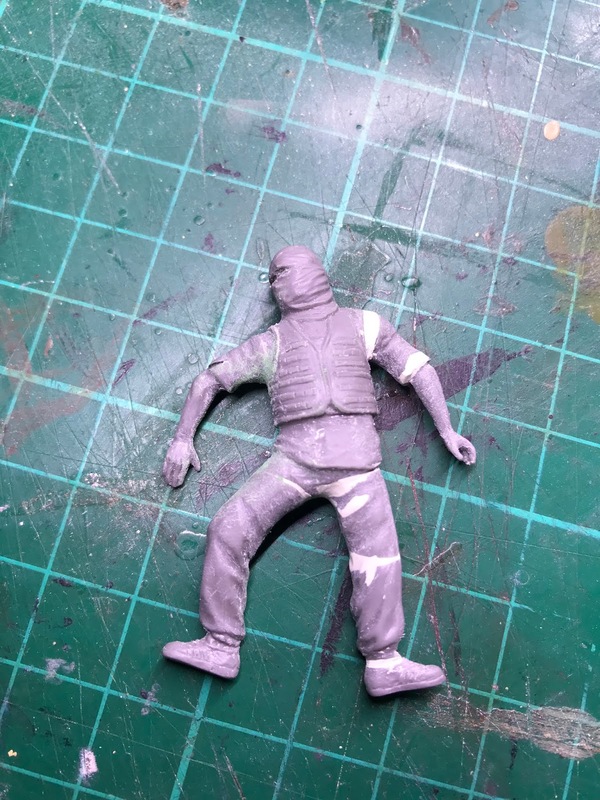 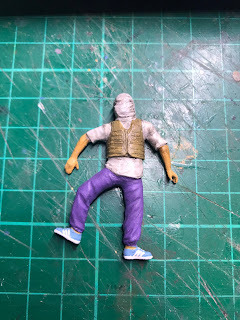 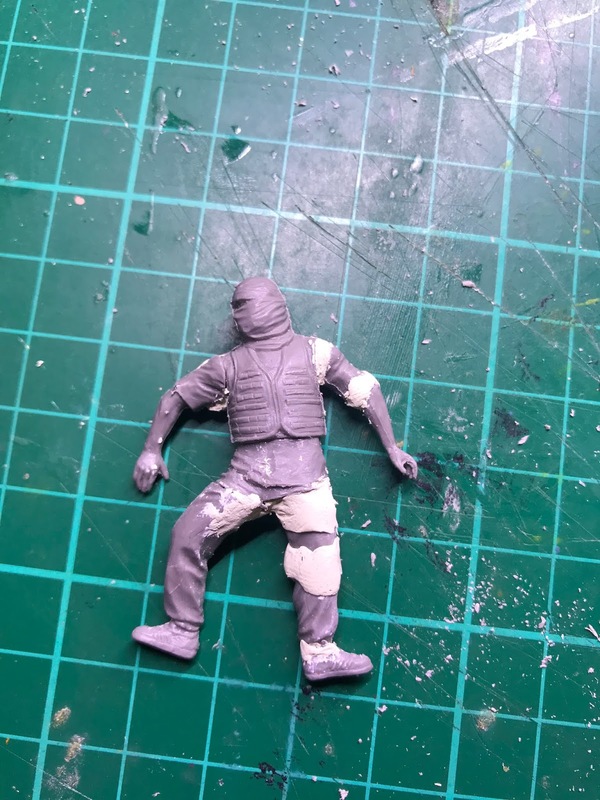 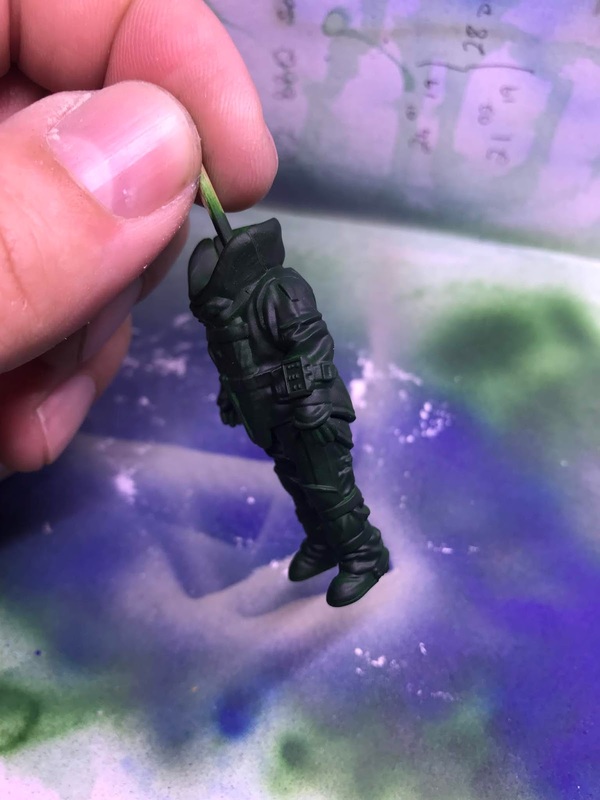 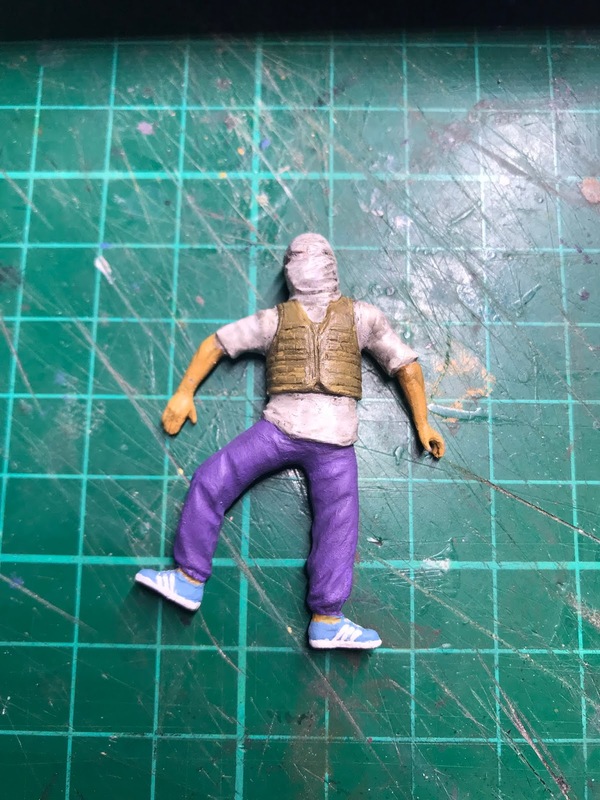 The figure was originally one from a masterbox set and was altered in such a way as the figure could be laid down having been dragged from the vehicle after he had been shot. basic Vallejo colours were used with games workshop Gory red used as the blood on the figure, road and in the vehicle. 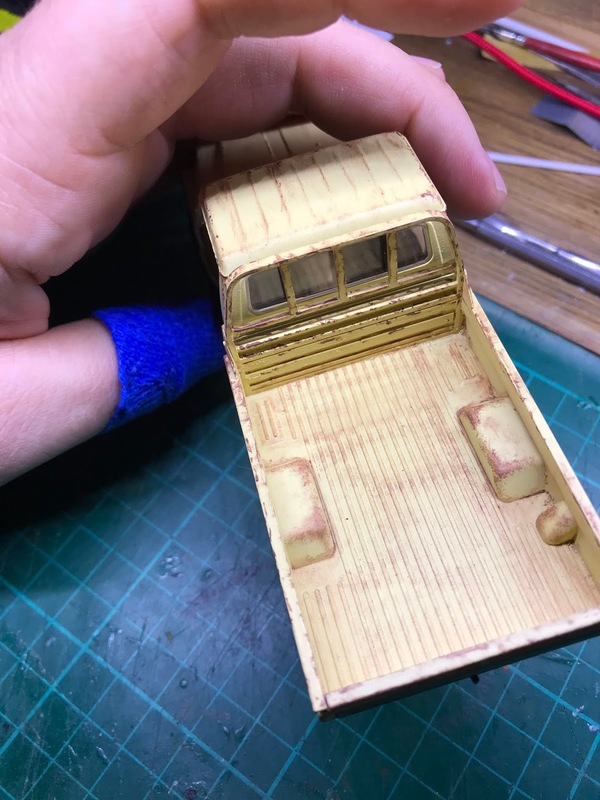 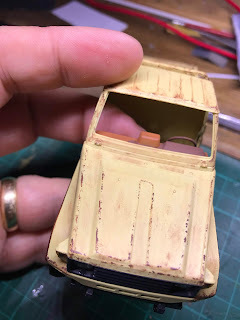 The vehicle glass was drilled randomly in the drivers area and then a thin brush was used with white paint to denote the cracking of the glass (I used an american gangland shoot out photo as reference). 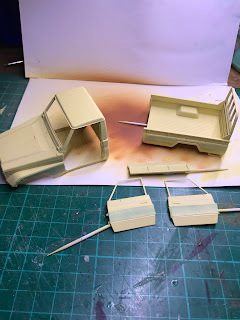 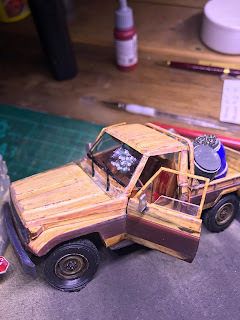 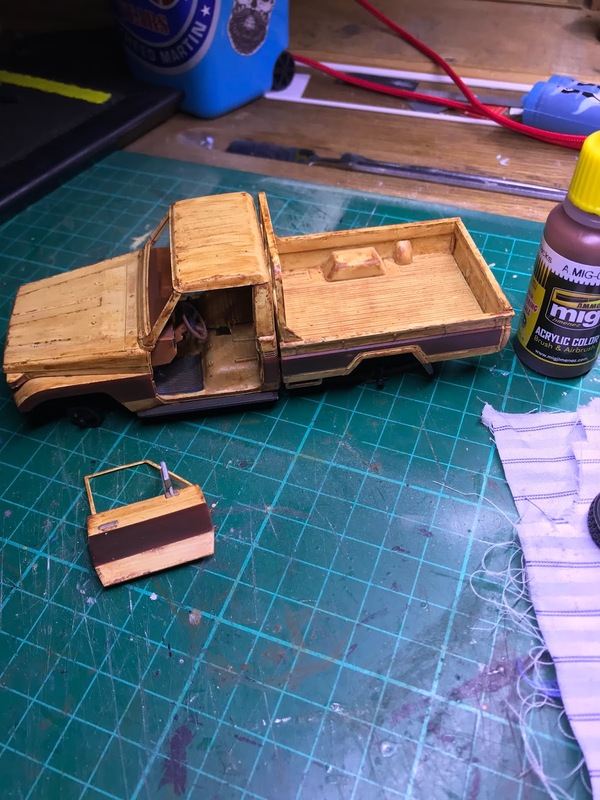 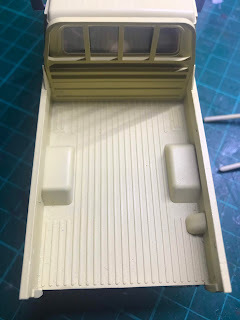 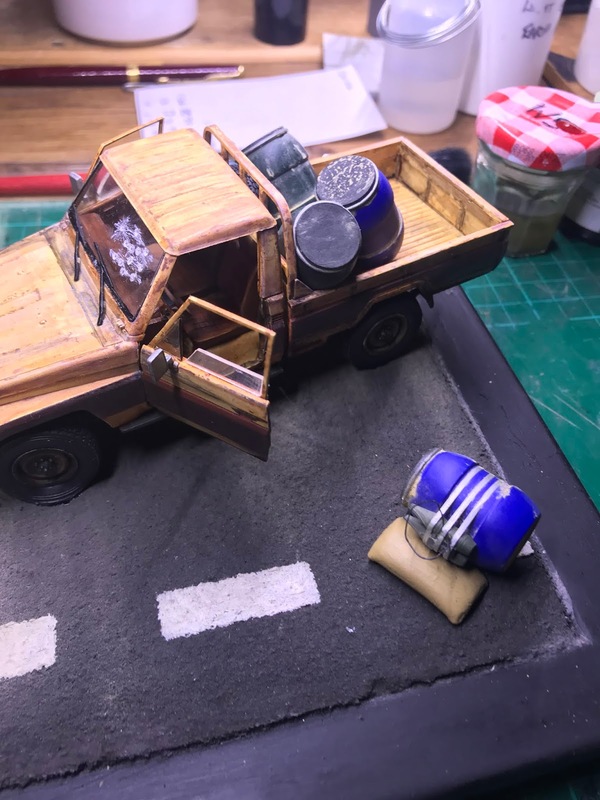 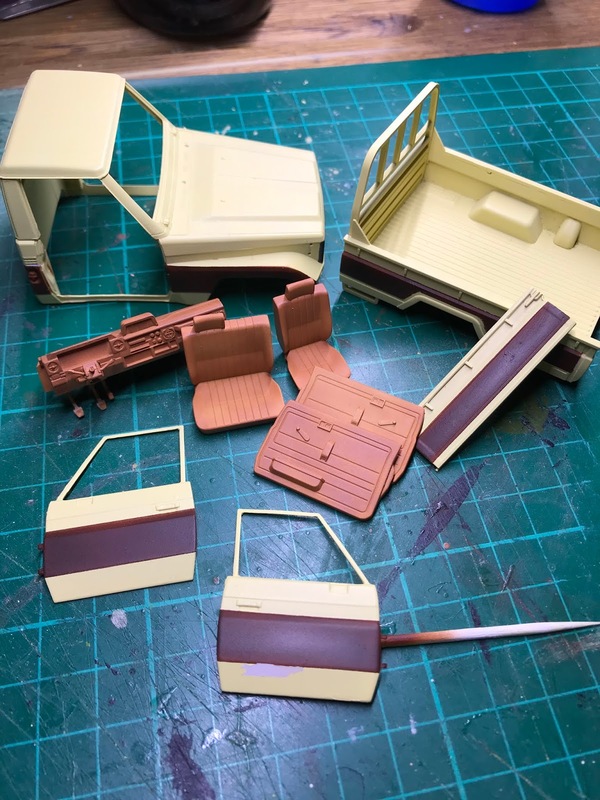 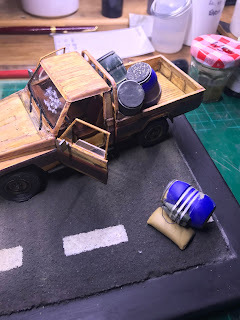 The finishing touches were then to add the large plastic barrels in the bed of the pickup and one that had been thrown clear as it had the extra weight of the warheads (supplied with the bob disposal kit). 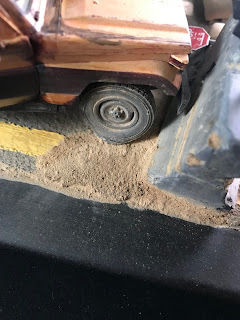 I also decided to depict both front tyres as being shot out and flat. This is again something that I had seen online (twitter this time) and always wanted to try. 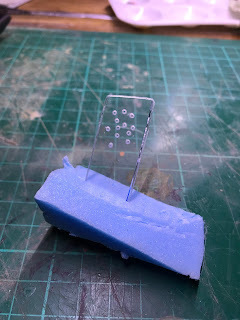 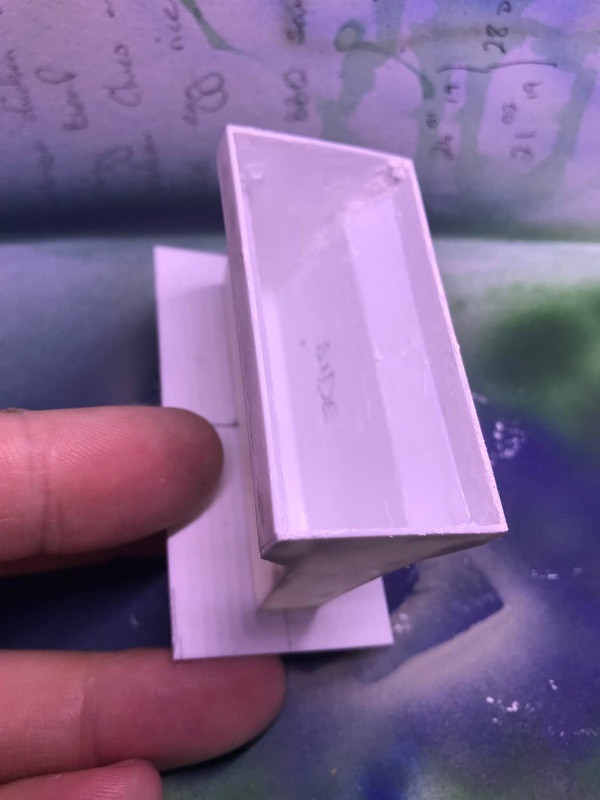 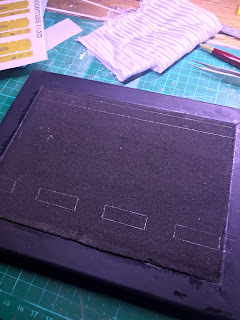 Essentially you slice down each side of the treads; remove the centre portion and then superglue the treads that have been splayed open onto some plastic card. Once dry you cut around the card and you have one very flat tyre!